Wordpress as we all know, is one of the best platform for blogging, WordPress also has alot of Plugins to make blogging easy and quickly. But it may be hard for newbies using WordPress to actually pick out the best plugins due to the fact that they have alot of plugins on the internet. 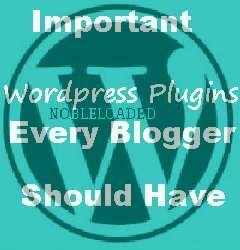 In this post, i’m going to list out some WordPress Plugins you should have on your blog. This plugin is one of most downloaded plugins ever, All in One SEO Plugin is great for those who don’t have much information in SEO, this plugin works great. I recommend all blogger to use this plugin to optimize your posts for search engine. Every blogger want to get more and more comments on their posts. With this plugin bloggers will reward readers for commenting on their blogs, commentluv will auto post a link of the blog post of the commenter along with his comment, So commentLuv plugin encourage people to post comment on your blogs. This social media plugin allows peoples to share you blog post to over 120 social platforms like, Facebook, Twitter, Google plus, Email, Pinterest and much more. With share this plugin you will get lot of traffic from social sites. This plugin is a easy-to-use and fully functional contact form, contact us page means a lot for all bloggers, so this plugin is a gift for them, this plugin may save your time for coding a contact form. Spam is one of the major problem for any website owner, peoples trying hard to find a way for spam protection, Akismet plugin solves this issue by protecting your Blog from spam. As a Blogger you know that Google Analytics helps a lot to analyze the performance of blog, with this plugin bloggers can use same features more easily. Sitemap enable search engines to add pages of your blog to their directory, this plugin creates a sitemap for your blog and when you add any page or content in your blog, this plugin auto notifies major searches engines to re-index your blog. Subscribe to comments reloaded plugin allows users to get a update via email any time someone comments on that page, this plugin is also a great one to keep a conversation on. This plugin saves your WordPress backup, if anything bad happen to your blog, you will have your site backup to restore, this plugin may cost you some money but it is easy to use, if you want a free plugin for WordPress backup then you may try XCloner. This is the list of WordPress Plugins i think each WordPress user should have. Do you think i missed any important plugin in my list? Please do well to drop them in the comment below. though a word of caution, many plugins can cause to slow down your site a bit. A personal request – pl make your font little bigger, it's really hard to read it out. Hi Jivita, welcome to my blog. Yes i agree with you that many plugins can cause a slow down of a site, that is why it is right to use few. And about my Font you complained, i'll surely work on it. Hope to see you here again. Thanks! Nice information. I actually use Google Analytics for WordPress and really love it!!! I would really like to try Akismet as I have been getting a lot of spam comments recently. Thank you for sharing this. Hello Sauumye, you really need to try it out. Thanks for the info. What about Jetpack plugin? Is is not an important plugin?